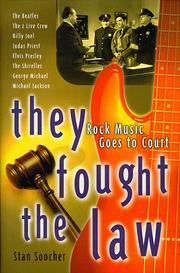 A survey of mostly well-known lawsuits involving pop musicians, with an emphasis on forbidding legal arcana. Soocher, an entertainment lawyer and music journalist, summarizes George Michael’s efforts to get out of his contract with Sony Music; Billy Joel’s management woes; suits against Judas Priest for including suicide-provoking backward satanic messages on a record and against Michael Jackson for plagiarism (both defendants were exonerated); the Elvis Presley estate’s largely successful efforts to squash unlicensed use of Elvis’s name and likeness; royalty- reclamation efforts by the Shirelles, Gene Pitney, and B.J. Thomas; the recently resolved quarter-century barrage of suits by the former Beatles against their record company, their managers, and one another; and two episodes involving 2 Live Crew: obscenity charges in Florida, which the rappers defeated, and a suit contesting the group’s right to use a Roy Orbison sample, which resulted in a Supreme Court victory on fair-use grounds. Soocher tries to insert narrative drama in the form of quotes by people involved in the suits, but he consistently refuses to draw conclusions about the larger issues the suits raise, which leaves the reader frustrated. The Joel and Beatles chapters, in particular, are full of legal niceties of interest to few beyond the parties involved, but even the sensational 1990 Judas Priest case comes across pallidly. Colorful characters on both sides of the 2 Live Crew obscenity case, some of whom the author interviewed, liven up that chapter considerably. But when Soocher talks about the Shirelles action, he picks apart the business practices of one oldies repackager without mentioning all the other, more historically important rock pioneers with empty pockets, which leaves the story dangling out of context. Soocher is a sound legal reporter, but his courtroom tales supply little of the charismatic derring-do promised by the title.